Deep down inside, we all know that amusement parks should be for children and teens, but who doesn’t enjoy sliding down a tube with water splashes around and landing in a deep pool? I know I do, and you should too. The southern parts of Spain are well known for their amazing weather and scorching sun and sandy beaches. 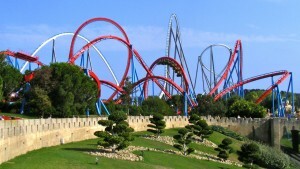 You might want to bring your team on one of the most nerve racking roller coaster in Europe, here in Spain you can do, and we can help you do it. The starting point for this activity will be from a meeting point in the centre of Barcelona, or you accommodation, it´s up to you and your team. And the adventure begins! Make your way to one of Europe´s largest amusement parks -Portaventura-. This park has rides and activities for people of all ages, whether you are looking for the most enthralling ride, or the tamest one to just sit back and relax, Portaventura has it. The park is set up in a way that each area is based on a theme of a cultural nature, these parts are based on different parts of the world, making it not just a fun experience, but a somewhat educational one too. If you come with children, there is also a designated area for them. There is something for everyone here. With so many rides and activities at your disposal, one would naturally build up an apetite. Luckily the amusement park holds many eating and drinking areas for a refreshing drink and some energy for more of Europe´s biggest and best rides. You have a wide array of choices, ranging from Chinese buffets, to Mexican food, and your typical American Hot Dogs. Test your teams and your courage as you try out some intense rides, Europe´s Highest Roller-Coaster which is known for it´s 78 meter drop! (that´s 256 feet in case that hasn´t sunk in yet) is an absolute must at this amusement park. There is also the Furius Baco, which is the fastest ride in Europe, not the faint hearted. It reaches speeds as high as 135 Km/hour or 84 Miles/hour. Or the slightly tamer Sesame Street show, there is a ride for everyone. When all the fun is had and you can´t take any more, meet up at the exit with your driver and head off back to your accommodation in Barcelona! Make the most of the ride back to go over your favourite rides with your team.